"I am going to take a heroine whom no-one but myself will much like." 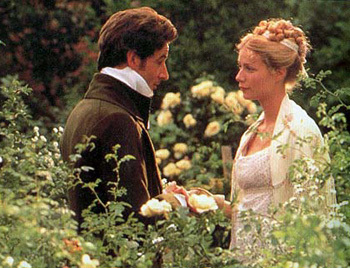 Welcome to The Emma Adaptations Pages, a resource dedicated to the film, television, and other adaptations of Jane Austen's Emma . Jane Austen once referred to Emma as "a heroine whom no-one but myself will much like," though the rush of Emma movie and television adaptations in the late 20th and early 21st century has proven her at least partially wrong. This resource was founded by Kali Pappas in February, 1997, and has been growing sporadically since. If you want to keep up with the updates, you can watch my blog or join my strangegirl*com updates list. You are also welcome to get in touch via email or follow me on Twitter. Hope you all like the "new" design! The title logo was made using Pia Frauss' Jane Austen font and the C.E. Brock frontispiece gem from a 1909 edition of the novel published by Dent/Dutton & Co. Thanks to Cinthia for providing wonderful scans of these Brock watercolors! Lots of new Emma adaptation news! As of fall, 2018, a new historical adaptation of Emma and a remake of Clueless are planned. The Emma adaptation is set to star Anya Taylor-Joy. It'll be directed by Autumn de Wilde with a screenplay by Eleanor Catton .The Clueless remake is coming from Paramount, producer Tracy Oliver, and writer Marquita Robinson. Clueless , the musical is coming to NYC in November, 2018! According to the press release: "Screenwriter and director for the film, Amy Heckerling is bringing Cher and the gang back to life with the help of The New Group, an off-Broadway theater company." Original Clueless director Amy Heckerling says, "It’s a jukebox musical. IIt’s as if the ’90s was one year, and we’re taking songs from the ’90s and playing with the lyrics to make them tell the story. We just had a sing-through/read-through the other day, and it went really well. They’re just wonderful young actors. A lot of them are coming [to the retrospective]." Late 2015 marks the 200th anniversary of the publication of Jane Austen's Emma ! Famed mystery writer Alexander McCall Smith is rewriting Emma for the HarperFiction Austen Project. His Emma will be available in Fall, 2014 in the UK and Spring, 2015 in the US (available now!). The Emmy award winning team that brought you The Lizze Bennet Diaries is giving Emma the multi-media web serial treatment! Emma Approved should be an entertaining adaptation of our favorite Austen tale! It begins online on October 7, 2013. Our coverage continues here. Anne Sharp's presentation copy of Emma sold again in late 2012! Paul Gordon's Emma musical is back, this time at San Diego's Old Globe Theatre. It's running through February 27, 2011. Maria Edgeworth's early copy of Emma sold for 79,250 GBP in a Sotheby's auction on December 16, 2010. More Information is located within the Emma 4 category of my updates blog. My reviews of the miniseries plus a collection of other resources are available via my Emma 4 index page. For screenshots, visit the Image Gallery. As of late April, 2009, it's rumored that a sequel to Clueless is in the works, reuniting Alicia Silverstone and Amy Heckerling. Silverstone's reps deny the rumors, while Heckerling's make no comment either way. Aisha (AKA Ayesha ) is premiering on August 6! This contemporary Bollywood remake stars Sonam Kapoor as Aisha, the "Emma" character in what promises to be a fun, Clueless -style romp. More details here. 2009-2010 BBC/PBS Emma costumes are on exhibit at the Jane Austen House Museum through May 16, 2010. Costume designer Rosalind Ebbutt will be presenting at the museum on May 7. Not adaptation news, but Anne Sharp's presentation copy of the novel was resold this week (March 29, 2010) for £325,000! Michael Bloom's stage adaptation of Emma is running right now at Drury Theatre in Cleveland Ohion through March 21, 2010. Emma 4 - premiered on U.S. television on January 24, 2010, running three consecutive Sundays through February 7 as part of the PBS/WGBH Masterpiece Classic series. The anticipated Jane Austen adaptation, which began filming in April, 2009, stars Romola Garai as Emma Woodhouse, Jonny Lee Miller as Mr. Knightley, and Michael Gambon as Mr. Woodhouse. It first aired on Sundays throughout October, 2009 on BBC 1. Emma 4 episodes are streaming at PBS.org until March 9, 2010. You can also purchase the DVD, which is available now at Amazon.com. Emma 4 Twitter Party on January 31: It's back! The first Emma Twitter Party was such a hit that we decided to come back for more! Join Vic and Laurel Ann for the 9-11pm ET timeslot, and author Laurie Viera Rigler and I for the 9-11pm PT timeslot. Both parties will feature a quiz. Participants in either quiz will be eligible for prizes from PBS.org and everyone who posts to the #emma_pbs hashtag during the events will qualify to use a special discount at ShopPBS! Cinthia's Brock scans and our usual assortment of Emma images are available in our new Image & Video Gallery. I've also added some illustrations from 1948 and 1964 edition of Emma provided by Laurel Ann, a couple of new Emma 2 videos, several of Vianne's fabulous (and my own not-so-fabulous) Emma 2 screencaps, and a crapload of Emma 3 screencaps. Emma 3 aired on March 23, 2008 in the U.S. as a part of the "Complete Jane Austen" series on Masterpiece Theatre. Laurel Ann and Ms. Place of the wonderful Jane Austen Today blog kindly invited me to share some notes and images regarding the fashions from this adaptation with their blog audience. If you'd like to check out the article, it's here. This isn't really Emma news, but it is Austen news. In October, 2008, I wrote a light look at the costuming in the 1986 and 2007 adaptations of Northanger Abbey for Laurel Ann's excellent Austenprose blog. Take a look, if you're interested. I don't get around to updating this site as often as I should, but I do try to keep it as current as possible. The materials I've included on this site are being used for educational purposes. I'm not making any profit from this site. I'm not giving away any free stuff that might make anyone lose any money. I'm simply promoting film, TV, and other adaptations of a public domain novel that I really enjoy. If you appreciate this site, please consider helping us out a bit. Some of you have been downright awesome in providing facts, articles, and other content for the site. For that I am unendingly grateful. If you don't have information or content to share but would like to help out, consider supporting our sponsors (below and to the left), purchasing a book or video through my Amazon Shop, or signing up for your own webhosting with Dreamhost (we'll get credit for the referral!). Everything we get goes toward site hosting and maintenance. Thank you! This Regency Ring site is owned by Kali. Subscribe to the Regency Ring Update - emailed monthly. Greek Folk Music and Dance and Past and Present Creations.